The Time Doctor website can be configured to allow your company’s clients to log into your Time Doctor account and review projects that are assigned to those clients. This will allow those you work with to see how the work they are paying for is progressing in real time. This article gives clients instructions how to log in and access their reports. To set up your client login feature, you must first configure the URL where the client will be directed to log in. 1. Under Settings > Company Settings, please make sure the Client module is ON. 2. From the Time Doctor web dashboard, go to the Clients page by clicking on Settings > Clients. 3. You must choose either a normal client login Time Doctor URL or a white-labeled domain URL. Please see this support article for more information about how to create a white-labeled domain name. If you are using a standard Time Doctor URL, you will need to choose the subdomain that you will be using and enter it in the field labeled Your Time Doctor Subdomain. Then click on Save. 4. Click on Add Client. The following screen will appear. You must enter your client’s name, email address, and password. This is where you create the password to give your client. 5. Once you have click Save, you will see the client listed below the domain name settings. Clicking on the Manage Projects button under the Manage Projects or Users column will display every project in your company. New clients will see nothing by default. You must manually add whatever projects and workers you want to allow them oversight access to. 6. Once your project and user selections are made, it is simply a matter of sending an email to your client(s) with the URL that they should use as well as the email and password credentials they will need to log in. NOTE: Your actual login URL will be different than the one shown in the sample screenshot. 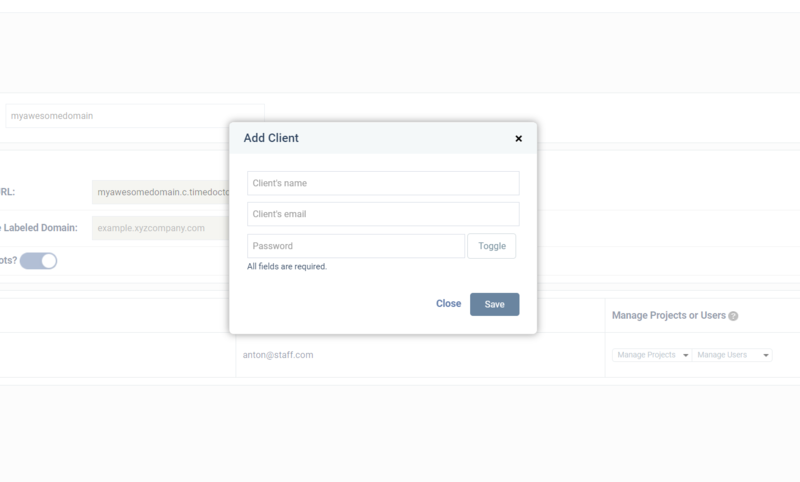 You may wish to refer your clients to this support article about how the client login feature works from their perspective.